Beverages can be found at the Towering Palms Bar & Grille. Cocktail service is also avaiable. Lunch is served at the Towering Palms Bar & Grille. Area is open all year round. Located on the sixth floor Terrace. Planet Hollywood (Formerly The Aladdin) got 2 stars based on 8 user reviews. For all the work done on the hotel itself the pool is very dissapointing. Great location but both pools are average at best. If your coming to Vegas to enjoy the pool I would skip staying at PH. We thought the pool area was not well planned out. The concrete area was a waste of space for the small pools. Other than that we loved the hotel. This was very nice....with a great view....I wanted to lay there alllll day....also nice bands playing as well. 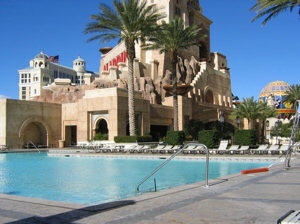 My opinon of the Aladdin pool(s) was that they were o.k., the views of the strip are great though. This is a very boring pool, just two pools and concrete. There is no atmosphere. Don't come here expecting a party. Hopefully Planet Hollywood will do something to spruce up the place. Great view over-looking the strip. Since there are no cabanas, an option for shade was the only thing that was missing.